The club meet every Thursday at Healds Hall Hotel, Liversedge (except after Easter, Spring and August Bank Holidays) to socialise, to have a meal and on most weeks to listen to a guest speaker. The first and third meetings of each month are held in the evening starting at 7.30pm with the other meetings at lunchtime starting at 12.30pm. The club always welcomes prospective new members so if you live or work in the area, are in business or a managerial role or retired, then why not come along and find out what we are all about? Contact the Sectretary and he will arrange for you to visit as a guest - you will be most welcome. Our members come from a wide range of backgrounds to share their knowledge with us and there is always something of interest to learn from them. A move to establish a Rotary Club in Heckmondwike was first made early in 1931 when the Rotary Club of Dewsbury began a survey of the district. On the 4th March of that year a first meeting was held at the Queen Hotel, Westgate. Eight proposed founders of the club were present and were given information about Rotary from the Chairman of the Yorkshire Extention Committee and five members of the Dewsbury club. The Queen Hotel was chosen as the Club Headquarters although the inaugural meeting was held on 16th April at the Masonic Hall with almost 70 people in attendance including 48 visiting Rotarians. Though the first members wholeheartedly accepted the Aims and Objects of Rotary they had some reservations about the Constitution and By-Laws, and these were not adopted as printed until 29th October. The first Rotary year closed with a membership of 28 made up of 15 founding members and 13 new ones admitted during the year. The club soon made its mark by winning the Attendance Trophy at three successive District Conferences in 1933, 1934 and 1935 - the first three in the Club's history! In 1935 the first Vocational service Committee was formed, organising essay competitions and mock interviews for school leavers. Additionally, members of the Club assisted a local school by organising Work Experience Schemes. In 1944 the old brewery offices in Market Street were for sale, price £750. The Club's Council obtained an option to buy with the intention of making it our permanent headquartes but this was not approved at a Special General Meeting. When the Inner Wheel Club of Heckmondwike was formed in 1938 for the ladies of Rotarians, one of the first in the district, their President's badge was given by our Club. In that same year the Rotary Club of Cleckheaton & District, which had been formed in 1932 after our territorial limits had been agreed, suggested an adjustment of the boundaries which would have reduced our area. This was firmly resisted. One of the earliest records of the work of the International Service Committee refers to support given to an Anglo-Egyptian refugee in 1957, arising from the Suez Crisis. A council house was made available, being decorated and furnished by the efforts of Rotarians, Inner Wheel and the Chamber of Trade, and employment found for the head of the family. Minutes of the early Council meetings show that the attendance rule caused great difficulty for some members, with some having to leave the Club for that reason. In 1956 two seats were placed in Green Park to mark the Club's 25th anniversary, and the first moves were made to tidy up a derelict plot of land at the top of Beck Lane which had been the site of a wartime emergency water tank. This came to fruition in 1959 when a garden, named The Dempster H. Lister Memorial Garden after the founding President, was handed over to Heckmondwike U.D.C. More recently it was improved with major renovation work by Kirklees Council. Weekly meetings commenced initially at the Queen Hotel. In 1940 the Club had to move to the Oddfellows Institute, lunching on a sandwich and a cup of tea, returning to the Queen Hotel after the war in 1945. In 1973 due to the floor of the upstairs room used at the Queen Hotel becoming unsafe, the venue changed to the Charnwood Restaurant which later (ironically) relocated to the former Oddfellows Institute. The current headquarters is Healds Hall Hotel where we meet each Thursday. In 2017 it was decided that in order to help some members to attend, meetings on the 1st and 3rd Thursdays of each month would be held in the evening, with the others remaining at lunchtime. * Dempster Lister did a lot of community work in Heckmondwike. 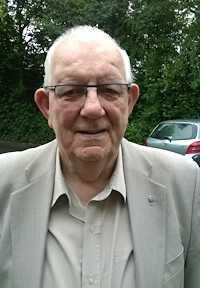 In his time he was a member of the Spen Vale Masonic Lodge, a special constable, founded the Heckmondwike Players amateur dramatic society, was the chairman of Heckmondwike Urban District Council for many years, was a Justice of the Peace, organised charabanc trips to the coast for under-priviledged children and ran a successful bakery business. How did he find the time!